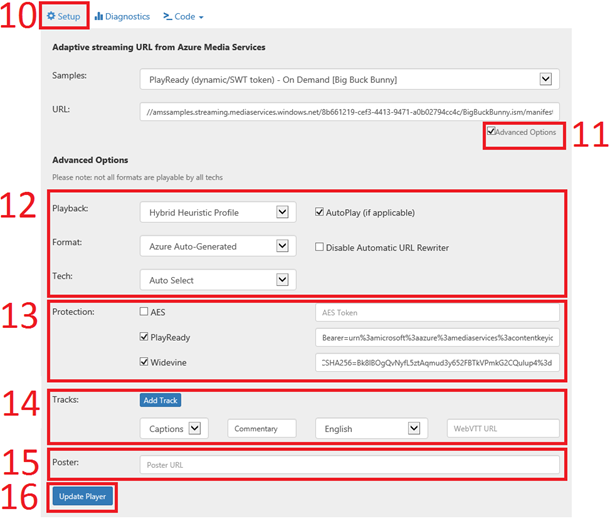 It’s time to update Azure Media Player (AMP) to version 1.6.1! This release includes a 33% reduction in size of the AMP scripts and the additional support for hotkeys and a time tip hover for accurate seeking as requested on the AMP UserVoice. There are also several bug fixes included in this release. 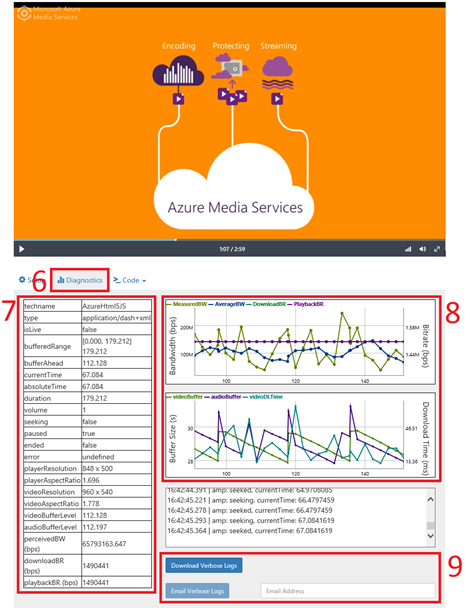 To check out a full list of new and previous updates, view the change log and check out my previous post to learn how to get started with Azure Media Player. The documentation has been updated to include information about accessibility features in more detail and expands on the compatibility matrix for completion. We also updated the demo page to include a whole slew of new features explained below! This is the sixth official release since AMP first released and there has been quite a bit of great feedback and this update addresses some of that. We are constantly updating and optimizing Azure Media Player, so sign up to stay updated with the latest that Azure Media Player has to offer. Also, we want to build Azure Media Player with you and would love to hear your ideas or what features you want us to build. Make yourself heard and help us on the AMP UserVoice. It’s easy to update Azure Media Player. Simply replace the version number of the Azure Media Player script and stylesheet that is in the <head> of your HTMLpage. That’s it! Don’t know how to write code? For new player settings, remember to click Update Player in the Setup tab to ensure your new settings are reflected in the generated code. This section is intended for a simple use case. For more complex scenarios, please see the provided samples. With the latest update to the demo page, we made it easy to see how your content is playing on various devices. We also added a Diagnostics tab (#6) to the demo page which gives you real-time information (#7) about the player and, when available with the AzureHtml5JS tech, also provides graphs (#8) for bandwidth measurements, download bitrate and playback bitrate with information on the buffer. This section allows you to easily download or email the verbose logs (#9) for simpler debugging. Note that some browsers, such as Safari on iOS may not allow you to download the log file directly, so you’ll need to utilize the email feature instead. With this new demo page update, there are additional options to try out the player. Click on the Setup tab (#10) and click the advanced options (#11). The advanced options now give you a variety of options to choose from for your startup settings (#12), including selecting the heuristic profile (AzureHtml5JS only) along with the ability to force select the tech or streaming format. The protection section (#13) now allows you to pick and choose which protection type you have dynamically packaged your content with in addition to allowing you to select multiple tokens in case they are different in the case of having both PlayReady and Widevine. Note: Your content cannot be protected with both AES and DRM. You can now add captions of subtitle tracks by clicking the add tracks button (#14). Lastly, you can add a poster for testing purposes so you can see how your poster will look (#15). Once you updated the setup, make sure you click the Update Player button (#16) so the new settings can take effect. You can share the demo page with your configuration with others by simply sending them the navigation URL in the address bar or by clicking the code tab and selecting Get share code. Azure Media Player will continue to grow and evolve, adding more features and enabling more scenarios. To help serve you better, we are always open to feedback, new ideas and appreciate any bug reports so we can continue to provide an amazing service with the latest technologies. Remember to read through the documentation and check out the samples first, they're there to help make your development easier. 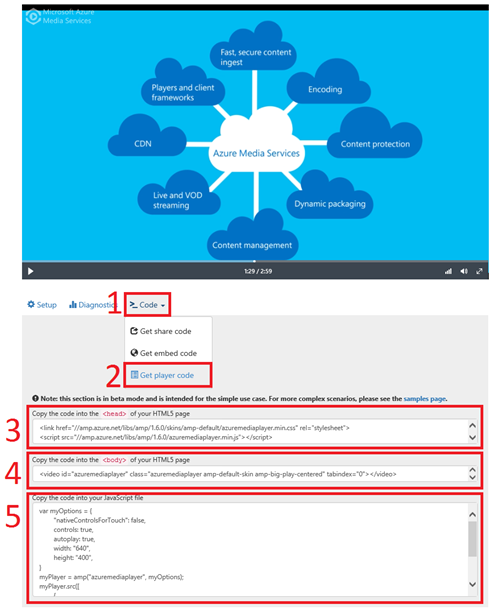 To request new features, provide ideas or feedback, contact UserVoice for Azure Media Player. If you have and specific issues, questions or find any bugs, drop us a line at ampinfo@microsoft.com. Sign up here so you never miss a release and to stay up-to-date with everything Azure Media Player has to offer.